1. Match the characteristic to the forwarding method. A host is trying to send a packet to a device on a remote LAN segment, but there are currently no mappings in its ARP cache. How will the device obtain a destination MAC address? It will send a request to the DNS server for the destination MAC address. It will send an ARP request for the MAC address of the destination device. It will send the frame and use its own MAC address as the destination. It will send the frame with a broadcast MAC address. It will send an ARP request for the MAC address of the default gateway. Which address or combination of addresses does a Layer 3 switch use to make forwarding decisions? Open the PT Activity. Perform the tasks in the activity instruction and then answer the question. How does adding an Ethernet line card affect the form factor of a switch? Destination MAC addresses will never change in a frame that goes across seven routers. A packet that has crossed four routers has changed the destination IP address four times. Destination and source MAC addresses have local significance and change every time a frame goes from one LAN to another. 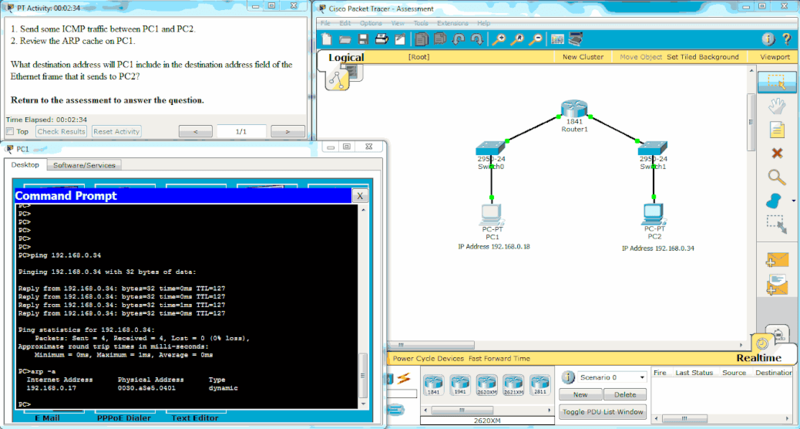 Destination IP addresses in a packet header remain constant along the entire path to a target host. Every time a frame is encapsulated with a new destination MAC address, a new destination IP address is needed. 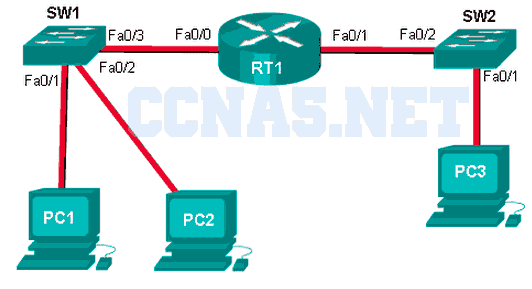 What is the Layer 2 multicast MAC address that corresponds to the Layer 3 IPv4 multicast address 224.139.34.56? What is the purpose of the preamble in an Ethernet frame? A Layer 2 switch is used to switch incoming frames from a 1000BASE-T port to a port connected to a 100Base-T network. Which method of memory buffering would work best for this task? The auto-MDIX feature will configure the interfaces eliminating the need for a crossover cable. The connection will not be possible unless the administrator changes the cable to a crossover cable. The duplex capability has to be manually configured because it cannot be negotiated. If both switches support different speeds, they will each work at their own fastest speed. The link between switches will work as full-duplex. The link between the switches will work at the fastest speed that is supported by both switches. What is a characteristic of a contention-based access method? It processes more overhead than the controlled access methods do. It scales very well under heavy media use. It is a nondeterministic method. It has mechanisms to track the turns to access the media. What statement illustrates a drawback of the CSMA/CD access method? 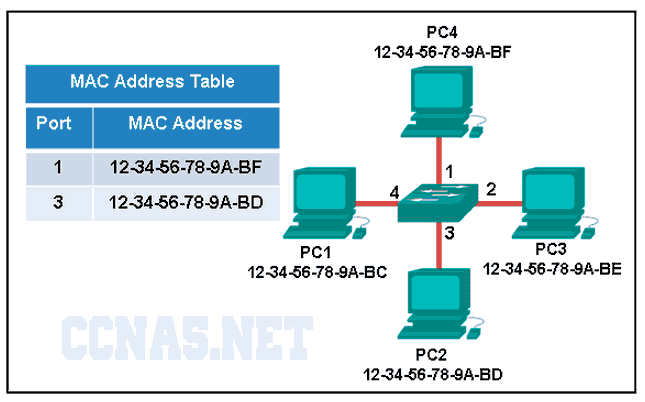 When would a switch record multiple entries for a single switch port in its MAC address table? An SVI cannot be configured on the switch. A fixed configuration switch may be stackable. The number of ports on the switch cannot be increased. The port density of the switch is determined by the Cisco IOS. The switch cannot be configured with multiple VLANs. The LLC sublayer interacts directly with the NIC driver software. What is the administrator configuring? The binary number 0000 1010 can be expressed as (A, a) in hexadecimal.